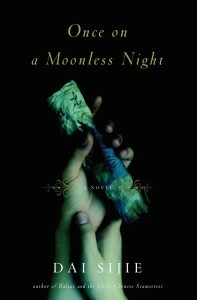 Once on a Moonless Night. Tr. Adriana Hunter. NY: Knopf, 2010. pp. 288. Once upon a time on a moonless night a man walked in the dark, then stumbled and fell over a cliff. This incident was later captured on a precious scroll in the form of a Buddhist sutra written in an unknown language. According to legend, this sacred text made its way to Xi’an in China where it was later found buried with the relics of Buddha Shakyamuni. After a temple was erected at the site of its discovery, the existence of the precious document was forgotten–until more than a thousand years later the Emperor Huizong by chance rediscovered the scroll hidden in the stupa of the Temple of the Gates of the Law. This scroll was to become one of the most prized pieces of the imperial collection, but it was later mysteriously lost after the reign of Puyi, the last Emperor of China. In Once on a Moonless Night (Par une nuit où la lune ne s’est pas levée, 2009), Dai Sijie recounts the story of three characters whose lives are closely intertwined with the story of this precious scroll: Paul d’Ampère, a French Sinologist who stumbles across a piece of the scroll and then dedicates the rest of his life to finding the remainder of the document; d’Ampère’s son Tumchooq, who is named after the mysterious language inscribed on the scroll; and a French woman who falls in love with Tumchooq and eventually solves the mystery surrounding the scroll. Through his characters’ stories, Dai Sijie–who was born in China but has resided in France since 1984–explores the ways in which European and Chinese cultures interact, a project he had already begun with his first two novels. Dai Sijie’s first novel, international bestseller Balzac and the Little Chinese Seamstress (Balzac et la petite tailleuse chinoise, 2000), was inspired by his experience living through the Cultural Revolution. He tells the tale of two teenage boys who have been sent to the countryside for reeducation. While there, they find and steal a suitcase full of Western books that end up becoming fuel that will fire their imaginations and provide them with their first sentimental education: French novels by Honoré de Balzac, Alexandre Dumas, and Romain Rolland. In his second novel, Mr. Muo’s Travelling Couch (Le complexe de Di, 2003), Dai Sijie recounts the adventures of Muo, a Chinese psychoanalyst educated in France who ends up returning to China to save the woman he loves. The French title of the novel, a play on the words “le complexe d’Oedipe,” the Oedipal complex, announces with humor the author’s intention to juxtapose and confront European psychoanalysis with Chinese traditional culture. Before he was able to find and translate the missing piece of the story, however, d’Ampère was falsely accused of stealing the fragment that he had in his possession. He was arrested by the Communist government and sent to a labor camp in Sichuan province. Later, d’Ampère’s son decided to continue his father’s work. It is when he suddenly disappears that the unnamed French woman takes her turn following in d’Ampère’s footsteps. As she progresses, she uncovers the manuscript’s extensive odyssey from the moment Buddha himself gave it to his disciples up to the year 1990, when an exhibit organized in the Forbidden City finally assembled the fragments of the scroll and presented them together in their entirety for the first time in decades. Dai Sijie chooses to recount this chronicle via the narrative in the French woman’s memoirs, which have been compiled and grouped into three distinct parts: Part I: “China 1978-1979”; Part II: “Wanderings 1979-1990”; and Part III: “Peking October 1990.” At the very beginning of her memoirs, the French protagonist encounters a specialist of Chinese history named Professor Tang Li. Tang Li recounts to her a description of Puyi’s last months as the Emperor of China and highlights a particular moment when Puyi, in a fit of rage on his way to Japan, opened the door of his plane and threw out priceless works of art. It is this scene in the novel that enables Dai Sijie to transport the reader a few decades back in time to the moment the scroll fell from Puyi’s plane. The scroll eventually finds its way into the hands of Zai Lan, Empress Dowager Cixi’s great-nephew who had been exiled to Manchuria. Zai Lan, it turns out, is also Tumchooq’s grandfather. From this starting point, Dai Sijie proceeds to lead the reader with dexterity and skill through a complex narrative that weaves several stories together. Along the way, he is able to revisit and re-imagine crucial moments of Chinese history. Historical documents are the vehicle Dai Sijie employs to provide his novel with an authentic historical feel. Once on a Moonless Night is filled with objects of historical significance: fragments of an ancient scroll, paintings, calligraphy, a black and white photograph, precious pieces of clothing. All of these items Dai Sijie describes at length and in great detail. Most of the stories in the novel are also carefully referenced from concrete (if often fictional) historical sources that include The History of Theatrical Presentation in the Court of the Qing Dynasty, An Anthology of Archives from the Intendant to the Court of the Qing Dynasty, The Secret Biography of Cixi and Auguste Pavie’s memoirs. Dai Sijie presents the novel itself as a compilation of several different documents: a diary, a notebook, research notes, and citations from various sources. In tracing the origin of each of the artifacts and texts that constitute his book, Dai Sijie actually mirrors the meticulous work that his characters undertake as they try to trace the origins of the Buddhist scroll. Taking a step further, it is not hard to discern an implicit reference to the work of Marco Polo and other Europeans, all of whom over the centuries dedicated their lives with passion and devotion to deciphering China’s language and culture. In chapter 5 of Part II, Dai Sijie actually goes so far as to establish an association and continuity between the work of Marco Polo, Paul d’Ampère, and Tumchooq by comparing the respective descriptions that each of them made of the cities they shared the experience of visiting. Aside from its use of historical reference, Once on a Moonless Night also pays tribute to the long tradition of translation that has played a crucial role in shaping Chinese culture. The novel is built around the search for a missing Buddhist sutra, but it is less the fact that the document is Buddhist that is essential to the understanding of the story and more that it represents a historical relic, the trace of an important moment in Chinese history when translation of Buddhist texts by missionaries was prevalent. In the end, Once on a Moonless Night is a novel about a quest–a quest not only for a document, but also for a lost language. Tumchooq, the language inscribed on the scroll, was once spoken in an ancient kingdom of central Asia, now long buried in sand and long forgotten. For Dai Sijie’s characters, however, this language has very much come back to life. Its sounds fascinate and even seduce: “The words he murmured sounded like a secret formula full of unfamiliar sounds, producing a vertiginous dizziness in me, a sweet intoxication, like drifting grains of sand bathing all my senses” (111). The language enables Tumchooq and d’Ampère to communicate during the son’s visits to his father’s prison camp. It is also, as Dai Sijie imagines it, what prevented the famed writer Hu Jie from succumbing to amnesia during his incarceration alongside d’Ampère. In the novel, Tumchooq represents the ideal language, the perfect language of communication from the time before the Tower of Babel, before any division of mankind. Emperor Puyi himself dreamt of this ideal language–“a language without verbs, just nouns,” a language “with which he could have written his own motto, painted in large characters on the walls of his residence:No verbs, therefore no concerns” (32-33). In contrast, the Chinese language is associated with pain. All of the novel’s main characters choose to abandon Chinese after they experience major trauma while in China. D’Ampère refuses to speak it after he has been arrested and incarcerated. Eventually he even asks his son not to inscribe any text on his gravestone after his death: he asks for “nothing, not a word or his name or a date, just a rough, white stone” (177). When Tumchooq finally leaves China, he decides never to speak Chinese again: “Writing to you will be the last time I use the language of my father’s assassins. I will never utter another word of Chinese” (175). Lastly, the unnamed French woman puts an end to her studies of Chinese after her lover abandons her. In fact, learning and speaking a foreign language emerges as a major commitment that defines–and at times destroys–the characters’ lives, in some ways reflecting how the progressive mastery of a foreign language has defined Dai Sijie’s own career as a Chinese writer living and working in France. [ 1 ] Dai Sijie chose to write all of his novels in French , as most Chinese writers residing in France have chosen to (with the notable exception of Gao Xingjian). [ 2 ] He has also experimented with his use of the French language from the moment he began to work on his first novel, adopting a different style and tone with each ensuing book. With Once on a Moonless Night, Dai Sijie departs from both the romanticism of Balzac and the Little Chinese Seamstress and the humor and irony of Mr. Muo’s Traveling Couch. His third novel’s sophistication and complex structure enable him to explore crucial psychological depths. In addition, Adriana Hunter has faithfully translated his elegant prose into English, keeping the poetic and sensual quality of the original in her translation. While one might feel that his novel’s historical references fit almost too well the pre-conceived expectations that his western-educated audience could have of China, his novel succeeds in enchanting the reader and maintaining suspense through to the last page. Once on a Moonless Night is a remarkable achievement. It is Dai Sijie’s best work thus far. [ 1 ] In addition to Balzac and the Little Chinese Seamstress, Mr. Muo’s Traveling Couch, and Once on a Moonless Night, Dai Sijie’s also chose to write L’Acrobatie aérienne de Confucius (2008) andTrois vies chinoises (2011) in French. These two novels have not yet been translated into English. In addition to writing, Dai Sijie has also directed five feature films: Chine ma douleur (China, My Sorrow, 1989) for which he received the Jean Vigo Prize; Le Mangeur de lune (1994); Tang, le onzième (The Eleventh Child, 1998); Balzac et la petite tailleuse chinoise (Balzac and the Little Chinese Seamstress, 2002); and Les Filles du botaniste (The Chinese Botanist’s Daughters, 2006). Balzac and the Little Chinese Seamstres was selected at Cannes and was nominated for Best Foreign Film at the Golden Globes 2003. [ 2 ] François Cheng, Shan Sa, Ya Ding, and Dai Sijie have all followed in the footsteps of Chen Jitong, a Chinese diplomat who became the very first Francophone Chinese writer when he wrote several works in French during the late Qing dynasty. Ying Chen is another Francophone Chinese writer who lives in Canada.